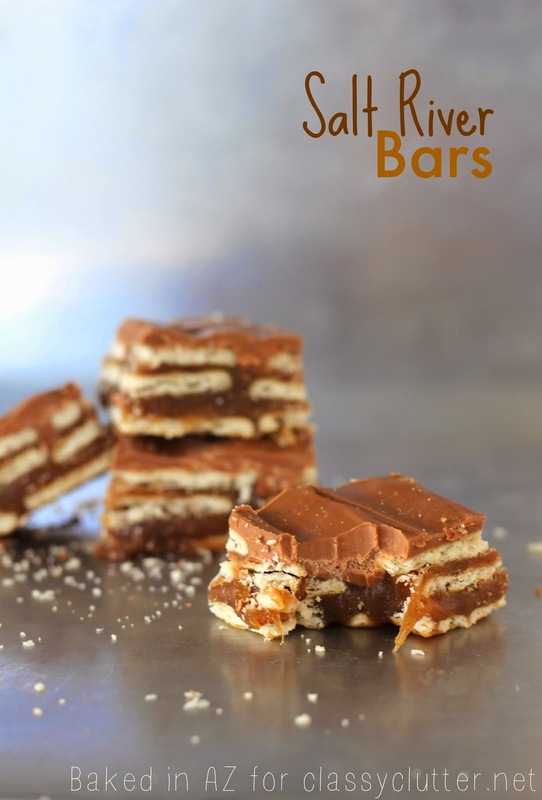 Salt River Bars – the perfect no-bake summertime treat! 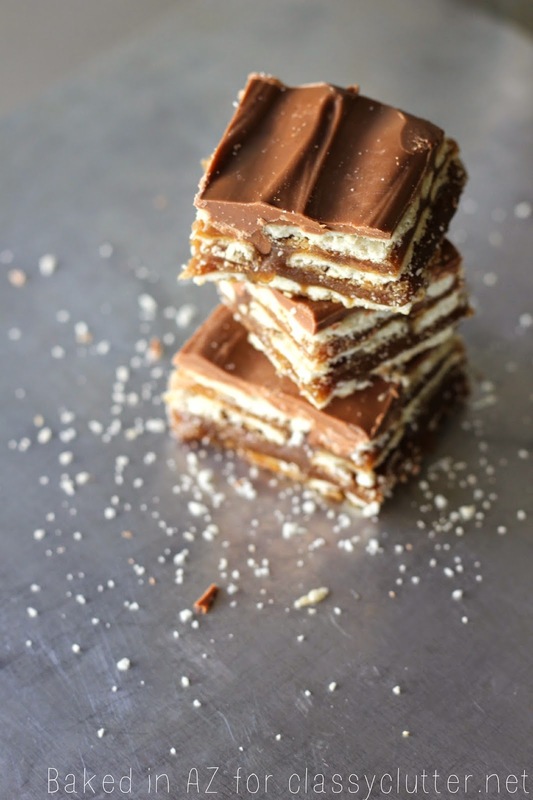 These bars are a perfect, no-bake summertime treat! Hello Classy Clutter readers! Adell here, from Baked in Aziona. I hope your summer is going great so far. I am enjoying the relaxed schedule and lots of swimming with my kids. I am happy to be sharing a tasty recipe with you today! If you are from Arizona or have ever eaten at Liberty Market in Gilbert you may have tried their Salt River Bars. I am thinking they are named after the Salt River that is near by. And very appropriate beause these bars are a perfect mixture of salty and sweet! My favorite 🙂 After trying the bar the first time I asked the waiter what ingredients they used. I could tell it was a salty cracker with a combo of peanut butter, caramel & a hint of butterscotch. He told me they used club crackers, peanut butter & butterscotch. So I went home and did a little looking around. I found some recipes online and they were very tasty but not exactly like the original bars. So after trying a few recipes, I found one I thought was the closest to theirs. I adjusted this recipe a little bit to be a 6 layer bar instead of 3 because more is always better right?! haha. And because that is how they are at the restaurant. 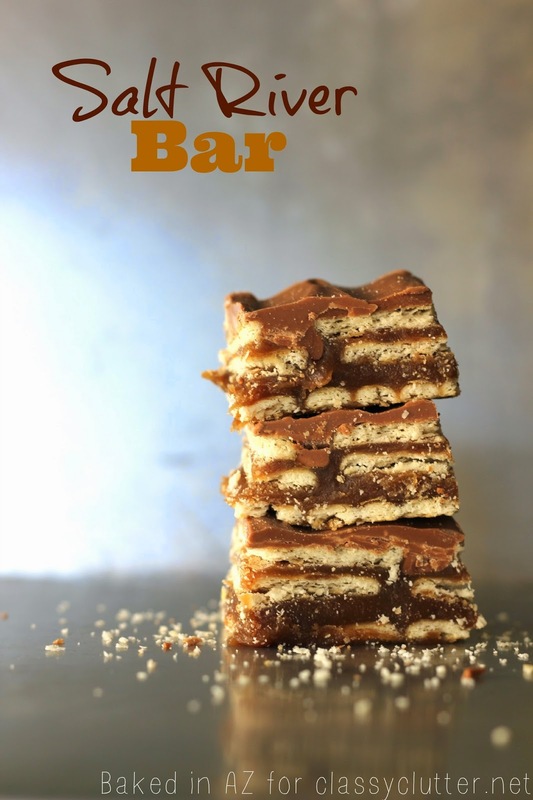 The bars are a little messy and crumbly but you won’t care because they are seriously amazing! And make sure you serve them chilled. They taste better and won’t start to melt on ya. You gotta make these for your next get together. I made these for a “Girls Favorite Things” party last week and they were a huge hit. Another great thing about this recipe is you don’t have to heat up your oven! Enjoy! For the bars: Line a 9×13 inch pan with parchment paper or foil*. Next place one layer of the crackers in the pan so they are touching and cover as much of the pan as possible. You can cut to fit it needed. In a medium sized pan, bring the butter, graham crackers, brown sugar and milk to a boil. Boil for 7 minutes stirring consistently. Remove from heat and stir in the vanilla. Pour half of the caramel mixture over the crackers. Add another layer of crackers like before, then pour the other half of the caramel mixture over that. Finally add one more layer of crackers then set aside. For the frosting: Melt the chocolate chips, butterscotch chips & peanut butter over medium-low heat, stirring consistently. When smooth poor over the top of the bars. For a quick set up time, put in the freezer until firm. Cut into desired size once firm. Store in the refrigerator. Serve chilled. *You can use a 10×15 inch jelly roll pan if you have one (I don’t). The 9×13 pan makes them thicker and “ooze” some of the caramel around the edges. Thanks so much for sharing this amazing recipe with us Adell! If you’re not already, head over and follow Adell’s blog, Baked in Arizona on Facebook, Instagram, Twitter & Pinterest!